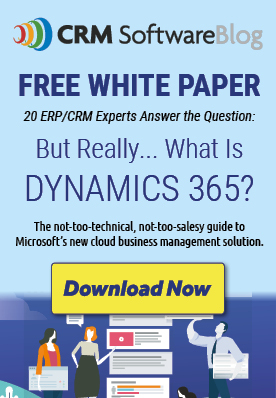 Comments Off on What are the Advantages of Customizing Your Microsoft Dynamics Customer Relationship Management (CRM) Tool? A CRM application is useful in and of itself as it allows you to manage everything from your clients to your various contacts, not to mention help you handle your customer service process as well as marketing activities. But customized to fit and enhance your processes, your CRM will take your business to the next level: it can help you achieve your business goals and improve productivity across your organization by streamlining your company-specific processes as it will be adapted to your reality. You can automate tasks that your staff would have to perform manually otherwise, connect data for detailed reports and better insight, and facilitate the management of projects and invoicing. For instance, the integration to Outlook, SharePoint and OneNote can be leveraged to link processes that are currently managed in shared drives, Excel spreadsheets and other non-connected tools. Furthermore, users who are familiar with the interface of your CRM application will have no trouble navigating it while taking advantage of its powerful functionalities. What are the benefits of customizing our CRM solution? The main advantage of a customized CRM solution is that it works the way you do. You can increase efficiency across your organization by ensuring that your system adapts to your processes and operations instead of the other way around. You can consolidate all activities, clients and other resource details since the solution can be adapted to match previous names and forms as well as fit your company’s internal jargon and needs. This will ensure a high user adoption rate as users will feel that the system was built around their specific needs and will be able to adapt to it quickly. What are you able to customize? There’s virtually no limit to what elements can be customized in your CRM solution. From fields to forms, not to mention business processes and workflows, you can ensure that your system is modified to meet your specific needs and operations. Views and reports can be customized to give you the data and the amount of detail that you need when you need it, ensuring that you get enhanced visibility into your organization and the information necessary to manage your operations. Is it easy to customize my CRM? Microsoft have made it easy with what they have named an “xRM solution”. The framework of the Microsoft Dynamics platform is used to build relationships between various elements by taking advantage of its security, stability and other robust features like the intuitive navigation, offline functionalities and workflows. As such, an xRM solution goes beyond conventional CRM features by establishing links between elements included in your CRM and elsewhere. xRM does not refer to a specific type of software; it is an approach that modifies and uses the existing features of a Microsoft Dynamics customer relationship management solution to create a variety of relationship-based interactions. Microsoft coined the term xRM, in which the “x” stands for “anything”: in other words, any of the various elements that can be managed with this type of solution, such as suppliers, assets, resources, partners and distributors, to name only a few. Can anyone do these customizations? The platform is easy enough that you can do a lot yourself with a little training. These competences do take time to develop so it may be best for first-timers to validate your vision with a value-added reseller who can let you know how to best achieve the goals you have in mind. If you have more heavy-duty customizations in mind, then you should probably look for a reseller with a development team and experience in your industry to ensure that they understand your processes and can properly guide you throughout the project to meet your objectives. A customized CRM is one way to increase the user adoption and shorten training times within your organization. Prior to any CRM customization project, you should have a vision of what you want to implement and prioritize. This way, you can carry out the project through a phased approach, which ensures that not all departments and operations are affected at the same time for minimal impact on your organization. For more information, read our case study to find out how a not-for-profit organization optimized its operations with a customized CRM solution. Posted in About Microsoft Dynamics 365, About Microsoft Dynamics CRM, by ISV/Add On Partners, CRM Software Information, xRm | Comments Off on What are the Advantages of Customizing Your Microsoft Dynamics Customer Relationship Management (CRM) Tool? xRM – Microsoft’s “Anything” Framework – A Dream SMB Solution!